Do you love the new supplies and new school year excitement? I really love beginning a new school year! My kids get excited about a fresh start and brand new crayons. I’ve tried to capitalize on their excitement with some school-themed books. No, these aren’t books about going back to school or beginning a new school year. They are books that take place in school. This is your perfect back-to-school reading list to start off another school year! This is a wonderful book about a strong and creative teacher in the wilds of Alaska. This is the first book in a series about a second grade class that welcomes a creative new student who tells some pretty wacky tales. Marty would rather play outside all day, so when she’s cast as the princess of her class’ play, everyone is in for a few surprises. This book takes place at a magical boarding school that any student would beg to attend! This is a great book for older readers. It focuses on an eclectic class of 7th graders and the one teacher who seems to understand them best. August was born with a facial difference and has never attended mainstream school until his 5th grade year. He has one wish – to be treated like a regular kid. While sitting in class, Nick wonders why a pen must be called a “pen.” He decides to create his own word for a pen, never thinking that it would catch on and his entire school and town would soon start using his word. Two classmates scheme together to publish their very own novel. They decide to use a pen name and pretend to be adults as they work to publicize the book. This is an entire series about a class pet who sees the classroom from a completely different perspective. Matilda’s school has a headmistress who is a terror, but Matilda discovers she has the power to fight back. It’s boys vs. girls when a competitive 5th grade class decides to see who can go the longest without talking. Billy starts off his second grade year with an injury but learns to navigate school, friendships, and sibling rivalry by the end of his year. It’s difficult to go to a new school and make friends, but as Cece learns, it can be even more difficult when you are deaf and must wear a giant hearing aid strapped to your chest. Cara’s teacher will do nothing but sit and read the newspaper. He won’t even teach his students. So Cara schemes to publish her own newspaper so he teacher has something even better to read. Melody has cerebral palsy and can’t walk or talk, but she’s determined to prove to her classmates that she is more than her diagnosis. Sammy has a hard time fitting in with his 5th grade classmates. It doesn’t help that a robot designed by his inventor-mother attends with him and even thinks that Sammy is his brother. Two fourth grade girls begin the year as enemies, but thanks to a dare, discover that they have more in common than either realized. This is the thought-provoking tale of a little girl who tells her classmates that she owns 100 dresses. The other girls are unkind to her until after she moves away when they discover the truth about the dresses. Harriet keeps a notebook where she writes down thoughts about everything and everyone. But what will happen when her classmates read all of the things that she has written about them? A sixth grader finds an unexpected friend and a welcome listening ear through a class assignment when he must write to his favorite author. Holling has to spend his Wednesday afternoons with his teacher and she usually forces him to read Shakespeare. However, he learns quite a few things about motivation, courage, and even himself over the course of his 7th grade year. Poor Peter has a lot to navigate during his 4th grade year, but he’s constantly overshadowed by his adorable and devious younger brother. The prince must choose a wife so his father sets up a mountainside academy to find the future princess. Go undercover with 4 children as they try to understand the strange happenings at the Learning Institute for the Very Enlightened where the only rule is that there are no rules. I remember this book from when I was in elementary school. It’s full of wacky stories about a school where every day is a bit of an adventure. This is a fun series about a young girl who attends a boarding school and finds a new mystery at every turn. I have the entire series from when I was a child. My girls really enjoy these books! Poor Mildred! She isn’t doing very well in her studies at Miss Cackle’s Academy for witches. She can’t even ride a broomstick without crashing! Charlotte attends a boarding school where there are some strange happenings. Suddenly she’s mistaken for another student – one who attended the school in year’s past. It’s a slightly spine tingling adventure about time travel and friendship. Clementine is having a disastrous week. She can’t seem to stay out of trouble and out of the principal’s office. Ellen is having a big 3rd grade year – she has to deal with woolen underwear and her enemy Otis. Then she has a falling out with her best friend Austine. This is a fun story of friendship that will have you laughing out loud. Maggie is being a little bit stubborn when she declares that she will NOT learn to write in cursive. But when she’s appointed as the class mail messenger, she worries that all of the letters being written in cursive might be about her. There’s only one way to know for sure! Fifth grader Nora is actually a genius but she tries very hard to keep her intelligence a secret. One day she brings home a terrible report card just to prove a point, but suddenly the spotlight is on her and the secret is out! The school-yard squirrel was chased into the school by the principal’s dog. Can all the different class pets keep them both out of trouble for the night? Jordan is just an average girl. But when a class bully targets her, she has a decision to make. Should she take revenge or find a different way to beat the bully? What would you do if you had a pencil that contained all the answers? Ava has some decisions to make when she discovers the secret power of the pencil that she holds in her hand. This is a great coming of age book about middle schooler Addie Carle as she deals with heartbreak, the loss of a pet, teasing, and the inner turmoil of growing up. 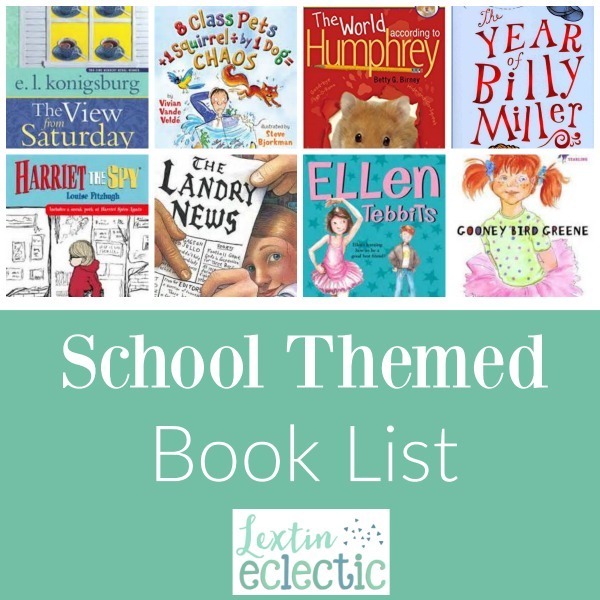 Enjoy these school-themed book for the start of a new school year! What a great list! Books always help my kids prepare for the new school year! Wow! Love that “Dear Mr. Henshaw” is on the list.